Girls' Night Out: It's Important! The first thing I think when I get an invitation for a Girls’ Night Out is “Wahoo! This is going to be fun!” In fact, girls-only nights are such a good time that I regularly schedule special evenings to enjoy with my women friends. We all get busy with our lives, our jobs, our families and our normal social commitments. But the benefits that are derived from dedicating time to a special Girls’ Night Out make their placement on your social calendar a necessity. Study after study has documented the extreme benefits that time with other women can provide to females. From your physical health to your mental health, the end result of a night spent with a group of girlfriends is lower stress, greater confidence, not to mention a surge in optimism that flows into all areas of your life. Because planning and attending a Girls’ Night Out says, “You’re important—so important that I’m clearing my calendar and making you a priority!” It says it to you, and it says it to your friends. And, let’s be honest, you need to say this to yourself more often, and I’m betting that your friends could stand to hear it from you a bit more frequently too. Just as you need to hear the words, “I love you” from your spouse, family or significant other, you also need affirmation from your friends to know that you are important in their lives. If you’ve read any of the other posts on the SocialJane.com blog, you already know that being in the company of other women is a great stress reliever for women due to the emotional and physical effects. By putting a date on the books and preparing to attend the event, you clear yourself from other responsibilities at home. In order to get to the event, you may have had to get a babysitter, or pre-cook dinner, or already have done the laundry. Having these things in place and off your worry list will allow you to go out and actually enjoy yourself instead of being concerned that you are missing out on the opportunity of organizing the sock drawer or checking your child’s homework. By doing the necessary prep work, you’ve already checked those items off your to-do list, and so you can relax, breathe and get in a good chuckle. Because, the truth is, women hanging with a group of women are just downright funny. And who doesn’t like a good belly laugh. Talking to the children and your husband, and heck, even your dog is fine for a while, but every now and again it is great to get out and have new conversations with your women friends. Why, because you’ll learn something new and interesting, or something silly that you didn’t know before, but that tickles you for days. Something like: there is a new book that is an absolute must read (anyone read Fifty Shades of Grey), that adding a dash of smoked paprika is the secret to great barbequesauce, or that U2 just announced their tour and tickets go on sale tomorrow! Of course, you may also learn something deeper or more intimate about a friend’s relationship, child, or job, a detail that would not have been shared except during an in-person gathering. And this is really the reason to get out and gather with your women friends, because when alone with each other, women open up and confide, and share encouragement, support, stories and … themselves. Enjoying a night out with the girls is so important that I recommend that you set a regular time and commit to it. Nothing is worse than clearing your calendar for an event only to have others back out. So if you make the plan, keep the plan (unless something really does prevent you). And when you find that you are longing for more of these fun and beneficial retreats, why not plan for a weekend get-away with your girlfriends? I bet it will become an annual occasion for celebration! 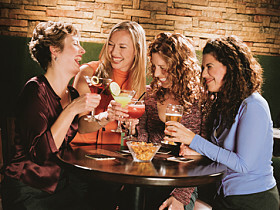 SocialJane.com is holding GNO events in Atlanta, Ga (July 23rd) and Arlington, Va (Aug 20th). Click here for more information on our Atlanta event!